Class M Rated Vault Panels are UL Rated modular for fast construction of UL rated vault rooms and storage rooms s in banks, research labs, materials handling warehouses, dispensaries, government facilities and more where Class II security level requirements are specified. Modular Vaults Range in size from 10x10 and larger, in both 5-sided and 6-sided. • Grows with your needs. For increased Class M vault room needs, branch consolidation or to create more space, just add more vault panels! We can help you cost-effectively enlarge the existing vault room at a fraction of the cost of changing a reinforced concrete vault. Our UL Rated Class M vault panels can be arranged to fit a wide variety of shapes. Experienced technicians erect your vault in five days or less, eliminating weeks wasted waiting for concrete to cure or forms to be stripped. 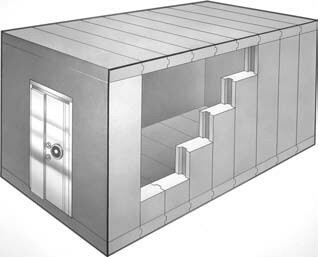 Our modular vault panels can be used to retrofit a gun vault or security room inside an existing building, room or home. 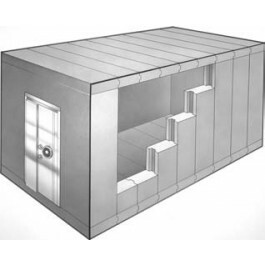 UL Rated Class M modular panels allow easy construction of UL rated vault rooms for security and storage requirements at banks, research labs, government facilities, pharmaceutical or controlled substance storage areas and more. Hamilton modular class I vault panels will also save you time and construction costs where weight requirements, or time constraints are prohibitive. Vault panel construction is lighter and much faster than conventional reinforced concrete construction and panels come in four rating classes. Made in the USA. Hamilton Safe Class M security requirement vault panels earned U.L. approval by withstanding severe torch and tool attacks. They meet or exceed all insurance standards.